Third Coast Surf Shop owner Ryan Gerard and local surfing legend Jack Nordgren were interviewed for an ABC story on Great Lakes surfing. One thing never seems to change: people's interest in surfing these vast freshwater seas. When people ask us why Great Lakes surfing continues to become more popular I often have one word in response: technology. Yes, technology, in more ways than one; technological advancements in the wetsuits we use, which continue to get better and better and allow more and more people to access the surf year-round; technology in our daily lives, including the internet and smart phones we all use, allowing us to access everything you need to know about Great Lakes surfing and stay in constant touch with other people doing it; technology in the form of the media, which is constantly at our fingertips, reaching people throughout the world. When you think about it in this context, it's no surprise that Great Lakes surfing continues to become more popular. 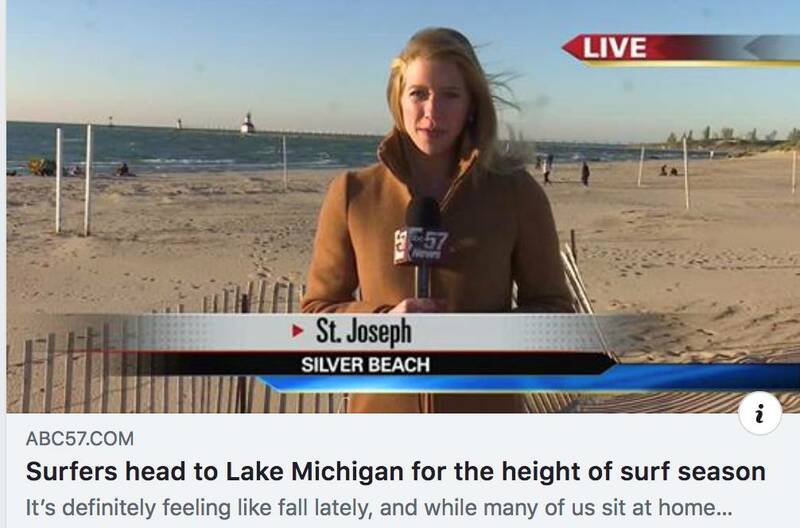 A reporter from ABC 57 News in South Bend, Indiana contacted us recently about doing a story on Great Lakes surfing. It so happened that we had a good swell coming a few days later, so we met at the shop for an interview before heading down to the beach for a windy surf. We also put her in touch with our long-time friend and local surfing legend Jack Nordgren, who started surfing in St. Joseph in 1965. Jack rented a room in a house on the beach owned by a woman named Ersula a couple summers later, and ever since, our local stretch of surfing beach between Silver Beach and Lion's Park has affectionately been known as "Ersula's".